So I know I said I was going to do something savoury for my next bake. But this Wednesday night I was forced to do an emergency bake, when a friend sprung a surprise on me. I knew that Billy, my former colleague and erstwhile deputy editor of Retail Banker International, was leaving his job for pastures new. But I didn't know when and so was surprised to receive an email on Wednesday evening saying that Friday was the big day and would I like to come to his leaving drinks. He signed off this email by saying "I checked out your baking blog the other day. Made me hungry". So now, obviously, I had to bake something. But what? I had less than half a block of butter, a little plain flour and some light brown soft sugar - nothing else. And I had only two evenings to prepare baked treats, so I wouldn't have time to buy a load of ingredients. Luckily, there is one thing that requires only butter, sugar and plain flour. The humble shortbread biscuit. Usually I would use caster sugar, but I thought the soft brown sugar actually gave the biscuit a good crisp texture. Shortbread is probably one of the least demanding bakes in terms of both ingredients and technique. It's the kind of thing a celebrity chef would refer to as being made with "staple ingredients that everyone has in their kitchen". 3. They are always referring to things like shittake mushrooms, pink peppercorns and fresh white breadcrumbs as staple ingredients and THEY'RE NOT, THEY'RE NOT. Nevertheless, flour, butter and sugar are very useful things to have and I had to adjust this recipe because I had not enough of any of those things. But I'll give you a recipe for a full batch, which can make around 20-24 biscuits depending on how thick you cut them. 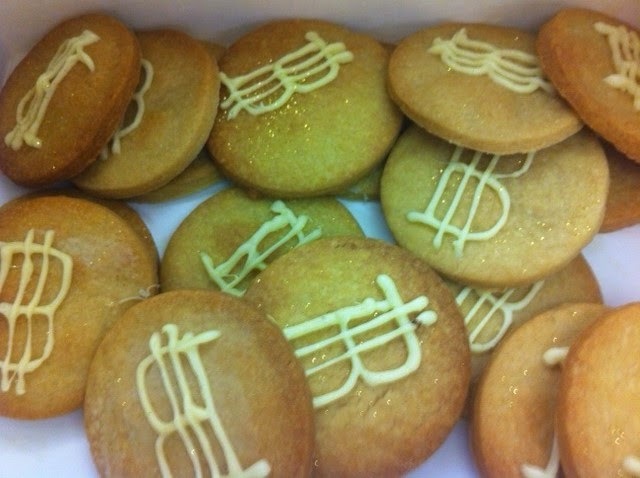 A theme for the biscuits was much easier to settle on - Billy has a long-standing fascination with and affection for the virtual currency Bitcoin, which although it has no physical form is usually depicted as a capital "B" in a serif font with two lines through it. For more on this digital currency and my last Bitcoin-themed bake go here. Or you could just google "Bitcoin" but then you won't see my Bitcoin cake. 175g unsalted butter, cut into rough cubes. 1. Preheat the oven to 180C. Take the butter, sugar and flour and rub it together with your fingertips to make a crumbly mixture. Quick tip - if your butter is too cold to be rubbed in, put it in a bowl of lukewarm water for a few minutes before fishing it out and shaking off the water. 2. Knead the crumbly mixture until it forms a smooth, pliable dough - but not for too long or it will be rubbery once baked. 3. Roll out the ball to the desired thickness, then cut out the biscuits with a biscuit cutter and place them on a lined baking sheet. 3. Bake for 10-15 minutes until golden brown, then leave to cool a little on the sheet then remove to a wire rack to cool completely. 4. While the biscuits cool, melt the white chocolate over a bowl of barely simmering water and then beat in enough icing sugar to make the mixture a little stiffer and more easily piped - I find white chocolate with its low melting point is too runny and difficult to pipe otherwise. 5. Pipe your desired decoration on the biscuits and leave to set. I also added a little gold edible glitter. You're done! Unfortunately these cannot be used as actual currency, but you can eat them, which is rather more satisfactory. Next time it WILL be savoury, I almost promise.